Ethanol heaters offer the homeowner a lot of great benefits! There is no chimney, ethanol heaters, because of the fuel they use don’t need a chimney, which means if you choose a floor model, your heater is completely mobile. You can take it from room to room, take it outside and even take it with you when you move. Ethanol heaters don’t produce any dangerous fumes when they burn, which is why they don’t need a chimney, the fuel is so clean that the final product of the flame is a small amount of water and carbon dioxide. You don’t get any ash! And you won’t get any soot, all thanks to the clean flame your ethanol heater burns. Super easy to use. Just take your bottle of ethanol, pour it into the burner and using a long lighter – ignite it. The flames will come in a matter of minutes, which means you can turn it on just as your guests arrive or to surprise a loved one. Icon Nero 1750 Wall Fire. The Nero frame collection is available in 3 sizes and two different colours. This is a wall mounted bioethanol fireplace that will look amazing in any living area or family room. These are simple to install and having no gas pipe or chimney they can be installed wherever you want it. Bioethanol burns clean and is environmentally friendly, producing no gas or fumes. The flame is soothing and natural that adds a touch of warmth and ambience to any room. The Icon Nero 1150 Wall Fire is available with stainless steel or black surround. 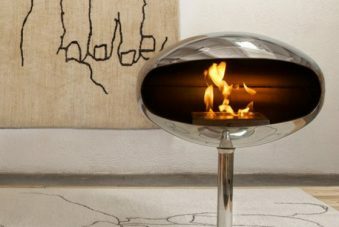 Cocoon Pedestal Stainless Steel Bio-Ethanol Fireplace. If you are looking for functionality, style and beauty, this is the one. Cocoon fireplaces offer contemporary style, perfect for the modern home. Environmentally friendly, it gently warms the room with no smoke, ash or fumes left behind. No flue is required, this ethanol heater is freestanding and portable, great for those living in apartments or renting. 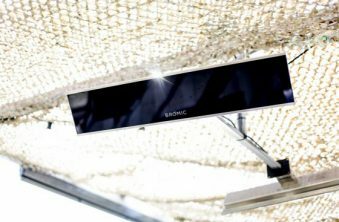 It can be used inside and outside the home and is a stylish addition to your home – wherever you place it. At 1.5 litre capacity, the Cocoon will burn for up to 6 hours. 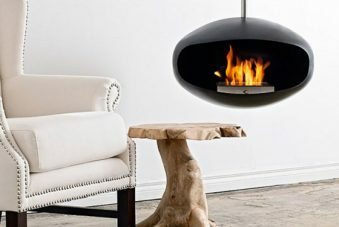 Cocoon Vellum Black Bio-Ethanol Fireplace. Cocoon fireplaces combine style and function perfectly producing an ethanol heater that looks simply stunning. Running on biofuel, there are no flames, smoke or smell while it radiates warmth through the room. With no flue needed you can place your Cocoon Fireplace exactly where you want it. The Vellum is a work of art as it hangs suspended from the wall, with a 1.5-litre capacity it will burn for up to 6 hours with no ash or mess to clean up when it’s finished.